THOR: Making-of A Superhero of the Gods! A Stan Lee, Marvel Comics super-hero character that is based on the Thor of Norse mythology, THOR will be seen on the large screen in 3D and IMAX with Shakespearean influence in director Kenneth Branagh’s re-telling of the story opening this Friday, May 6. At a press conference this weekend, Branagh said that his movie has a lot of Shakespearean influence. “Stan Lee went to the myths that Shakespeare hadn’t used.” Writer on the film, Ashely Miller stated that the story that producer Kevin Feige and Branagh wanted to tell is “about the god king who is cast down to earth and has to learn humility before he can return home -that’s the story”. As for casting the title character, Thor, Branagh said that they had to call actor Chris Hemsworth back after the story was more developed. The moment when he knew Hemsworth was the one, was when he got on set with Anthony Hopkins (who plays his father, Odin). “There was a quality of an innate charming confidence that did not spill over into arrogance or over-confidence that meant that he would stand up to Hopkins as the prince of Asgard and not shy away from it”. The other deciding factor, Branagh jokes was “when he takes off his shirt there’s a wow factor”. 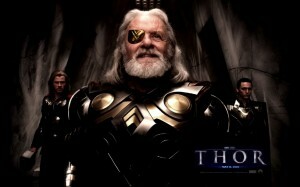 Hemsoworth said that he got his body ready for the role of THOR by eating 20 chicken breasts and rice and steak. “I don’t naturally sit at that weight, so I had to force feed myself. It wasn’t the fun stuff either like hamburgers and pizza”. The core of the story that Branagh and writer chose to focus on was about the rivalry between two brothers, played by Hemsworth and Tom Hiddleston as they vie for their father’s (Hopkins) succession in line for the throne. When asked how he prepared for the role that was a combination of comics and Norse mythology, Hemsworth said, “Instead of thinking how do I play a powerful god? It became about scenes between fathers, sons, and brothers”. The biggest challenge structurally for writers was bringing Thor back to earth from other worlds in order to show why he acts the way that he does. Hopkins decision to make the movie was because of Branagh. Hopkins admitted before he was cast for the role, he wasn’t sure how well Brangah would receive him since he didn’t fit into British theater. Also, “I never read Thor. I’m not a geek. But this…it turned out that it was the most enjoyable film I’ve been involved in for a long time”. THOR opens in theaters May 6th. Audiences will see the return of the Thor character, again played by Chris Hemsworth in “The Avengers” movie when it opens in 2012.